Ha Gian g, a mountainous province in the northeast of the country, is known for its unspoiled scenery, magnificent limestone mountains, thrilling, sloping roads and enriched ethnic cultural features, making it a must-visit destination. 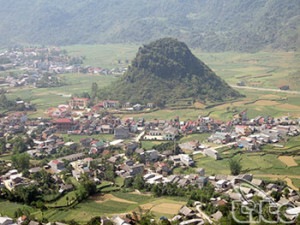 Nui Doi or Double Mountain is located along Highway 4C, in Quan Ba District. The mountains are shaped like a female’s breasts in the middle of a field in Quan Ba, surrounded by terraced rice fields which change color during different periods of harvest: green in the first period, yellow for the harvest and brown for the post-harvest period when farmers have to plough for the new crop. The most thrilling experience in Ha Giang is conquering Ma Pi Leng Pass. It is one of the four most dangerous passes in Vietnam and is 20 kilometers long. Over the Ma Pi Leng, there are some mounts 2,000 meters high located on Hanh Phuc ‘Happiness’ road connecting Ha Giang, Dong Van and Meo Vac Town. The road along the mountainside has romantic, spectacular scenery and is an ideal destination for tourists. Along with the boldness of Ma Pi Leng, the romantic Nho Que River will make the scenery even more perfect. Located in an upper area, via a slope there is a strong flow of water through the rugged rocks, which creates a waterfall icenery.